4th in the series baseball sim from Magical Company. 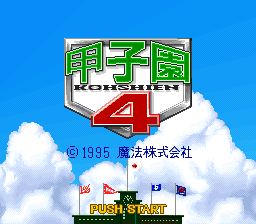 This games title is sometimes written as Kohshien 4. I have to admit, Baseball is not a very exciting sport to me and so baseball games always seem to be a case of learning the timing of swinging the bat and that's about all. Fielding in ALL baseball games is boring and useless and this one is NO exception!!! The tiny, dull sprites move so slowly that it is almost impossible to catch the ball!!! This is a HUGE cart size for a game like this, and I guess it has all been used up on teams, player stats and the limited management side because the sound graphics and gameplay are sorely basic and dull, even for a baseball sim. You think after 4 attempts Magical company would have got it right?, but NO, this is worse than the 2nd one!!! Still the award for best baseball sim on the SFC goes to 2020 Baseball and even that is limited!! !